Thanks for looking. 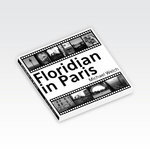 I’m Michael Welch, author and publisher of MrMikesMusicMats. I’d like to post detailed information about my (10) books, what comes in them and what you get for your hard earned money. •	All 10 of my books include introductory information about printing, copyright, lamination and cutting pages from the book. I’m you’re only curious about my curriculum this is the book to buy. Young Mozart Music Station contains individual unique designs/pages and compilation duplicates from my other 9 books. •	There are a total of (24) Twenty-Four (lesson/mats) pages in Young Mozart Music Station. My “Book Cover” has graphic images of each lesson / graphics/mats pages. Pages are Color and Black and White. •	This book “YOUNG MOZART MUSIC STATION” is the flagship of my curriculum. It contains a variety of lifetime teaching materials that will get you started. My book, “Lines and Spaces” is based my creative use of colors. I created my Treble Clef Notation mats and pages so they matched the colors of the Boomwhackers. Teaching with this theory as a daily method the student will quickly learn the lines and spaces of the treble clef. As they grow in their more sight-reading skills they will transition to the standard “Black And White” concept of written composition. I utilize the visual colors of each Boomwhacker. I start with the Red Middle C and continue through the “Lines and Spaces” of the Treble Clef. This is the C Diatonic Scale for the Treble Clef. Each Visual Treble Clef contains the matching Boomwacker Image with its corresponding color and pitch. All 10 of my books include (6) pages of Lesson / Utilization / Printing / Lamination / Copyright and contact information. 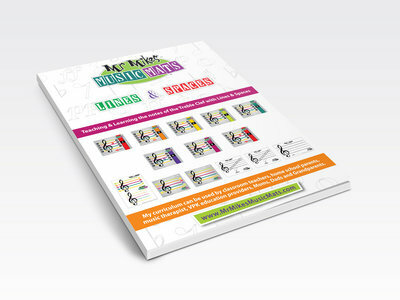 “24 Note Tile Sheets” will be used with multiple MrMikesMusicMats books, lessons and activities. Please look at the books cover and you will see thumbnail images of all 24 pages. The color and black and white chromatic and diatonic note tiles can be matched with the color C diatonic mat and the xylophone mat, piano mat, Boomwhacker bowling, Boomwhacker putt and the A Minor Mat. All of my 10 books contain a vertical “CUT HERE” dotted line to help you make straight cuts to remove the page from the book. For table or floor activities, early learners find and place the tiles on the Lines and Spaces of the Treble Clef. The rhythm notation note tiles can match the notes on Music and Math. Notes can be placed on the blank “Make A Beat” mats. Students learn to create their own beats and rhythms. Quarter notes and rest can be used with the “Quarter Note Beat Ensemble” and Treble Clefs. The color Notation Bingo Note Tiles can be cut from the sheet and used with the Black and White Music Notation Bingo mat. The (24) notation signs I’ve utilized in my curriculum are used in different lessons and activities. I created (2) different 24 notation books. I did this because of convenience and printing cost. Your classroom duplication is cheaper with Black and White. Both books (Color and Black and White) have duplicate backs with definitions of each notation sign. Classroom teachers, home school parents, music therapist, and VPK education providers, Moms, Dads, Grandparents and Montessori Educators, can use my Curriculum. The (24) notation signs I’ve utilized in my curriculum are used in different lessons and activities. I created (2) different 24 notation books. I did this because of convenience and printing cost. Your classroom duplication is cheaper with Black and White. Both books (Color and Black and White) have duplicate backs with definitions of each notation sign. The front pages of each notation sign, in this book are printed in beautiful color. There are quite a few music bingo games sold in the music education arena. My book is unique as a classroom activity. It’s fun and teaches students several things besides the 24 music notation signs. It is a recognition and memory game. It can also be played with student on teams. The (24) notation signs are the same (24) utilized with my Flash Cards. Reinforcement of learning by seeing and recognition. My “Music Notation Bingo” book includes (25) Black and White player cards and (5) Color caller cards. Every Black and White player card is different. Each student or player will have a different card layout. With groups of 15+ I option to use bingo chips. You can also copy the color caller cards, cut the (24) notation tiles and use those tiles as chips. “Music Notation Bingo” can be an activity played at tables or on the floor. My music and math book teaches early learners age 4 and up the rhythmic value of music notes. My book only uses addition. In my classes I begin by teaching the students these values. I use my notation flashcards on a regular basis. After they have a basic understanding of these signs, I play music and math games with them. (1) With two hands, I’ll hold up 2 fingers on my left hand. (2) On my right hand, I’ll hold up 1 finger. (3) The left hand is 2 beats. (4) The right hand is 1 beat. There are (4) activity pages and (54) numerical addition examples with answers in the “Music and Math” book. This book teaches quarter note rhythms. The ensemble is composed and based on (8) eight easy quarter note rhythms. The book includes a conductor score, (8) eight player parts plus 2 cut out pages. They include a blank “Make A Beat” sheet and a blank conductor (8) part sheet. Students love to learn this as a group. You can create various table, chair and floor activities. It’s also a great outside activity. As an ensemble this can be a graduation performance piece. I use Boomwhackers and rhythm instruments. 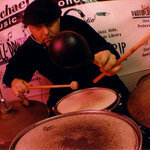 Just clapping or saying “Boom-Boom- Rest-Rest” works for each of the (8) rhythms. My “Eighth Note Beat Ensemble” is similar utilizing eighth notes and rest. “Eighth Note Beat Ensemble” includes a conductor score plus (8) eight player parts. The book includes (2) blank “Make A Beat” and “Eight part Conductor” sheets. Students love to have fun when learning. These rhythmic activities can be very creative, musical and productive. I created “Boomwhacker Ensemble” for early learners ages 4 and up. It’s a fun learning, performance and motion activity. In this book there are different performance variations of the quarter note beat ensemble composition. For this book I produced the “Quarter Note Beat Ensemble” in color to match the pitches of the Boomwhackers. There are (8) player parts plus (1) conductor score, in color. 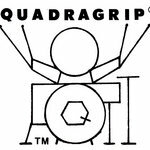 “Quarter Note Beat Ensemble” teaches the quarter note rhythms and “Boomwhacker Ensemble” adds the pitches. “Boomwhacker Ensemble” includes (4) variations. Each variation has printed parts for the conductor and (8) player groups or sections. (1) Boomwhacker Ensemble for eight players: contains (9) pages. Color conductor score and (8) individual player parts. Single measure parts with repeat signs. (2) Boomwhacker Ensemble 1: contains (10) pages. Conductor score and (8) individual player parts. This arrangement is 8 measures with repeat sign. Each player sheet is notated with the color that matches the Boomwhacker pitch. The conductor scores are also “color” matched. (4) Boomwhacker Ensemble 3: contains (16) pages. Conductor score and (8) individual player parts. This arrangement is (32) measures with a repeat sign. •	I began the creation of my “Early Learner” music curriculum in 2008. I’ve been teaching hundreds of early learners, infants & toddlers ages 2 up through PreK and VPK. Five days a weeks for Ten years. I retired from my classroom position December 2016. •	Those 10 years of experience have gave me much insight and knowledge into the field of early learner education, training and education provider management. •	(Number 1) My curriculum was created to “Help Others Teach The Gift Of Music,” (at every daycare/early learner education provider in the United States. That is my curriculums target market, Thousands of Home School/Parents/Montessori/Child Care/Education providers---millions of early learners. •	A curriculum like “MrMikesMusicMats” doesn’t exist. My curriculum is the only “complete music curriculum” in the world for “Early Learners” that provides music education to this age group. •	My curriculum is a BRAND. •	(Number 2) Education providers don’t employ “music specialist” because of extra cost. They may have a little “music station” in a corner with a couple percussion instruments, that’s about it. •	(Number 3) Early Learners / Kids / Students love my curriculum in their classroom. •	(Number 4) During my 10 years, 5 days a week of teaching, I’ve seen the struggles of teachers/educators in their classroom. I know how different fields of curriculum are taught during a child’s day. My curriculum is a welcome relief for classroom teachers. •	My curriculum contains a very high amount of Kinesthetic or Tactile Material. I use my materials very effectively in Montessori Classrooms. •	The teacher/parent/education provider can use my materials with their student’s, as they require, at the time they need it. This means, they can delegate it to a special student or to groups of students. •	My material, when used by the classroom teacher can be useful with classroom management. I’ve been in the trenches of early learner classrooms. •	(Number 5) My materials can be used on tables, floors, inside, outside and more. One student or several in a “Music Station” can use my materials. •	(Number 8) My curriculum benefits “early learners” at their most important learning stage. •	Though my curriculum is based on music it includes Reading-Math-Spelling-Writing and more. •	Lessons and activities based on the Kinesthetic, Tactile and Montessori concept. •	For those unaware of this method. It’s a “materials in hands “curriculum. •	The “students” learn from (physically) using my materials. Mr. Welch ! Who Do You Think You Are ?